Ravana, the demon King from the epic Ramayana, was an ardent devotee of Lord Shiva. Once Ravana went to Mount Kailash, the abode of Lord Shiva and after severe penance got a boon of invincibility from Shiva. Lord Shiva gave him a lingam (also referred to as atma-lingam) and told him to carry it to Lanka by foot and while on his journey back home, he should never put it on the ground and if he did, then the boon would not materialize and he would lose the lingam to the place he kept it. Some versions of the myth say that Ravana attained this boon after reciting the Shiva Tandav Stotram, which was composed by him in honour of Lord Shiva. Seeing this, other gods were worried about the boon. They then requested Lord Ganesha to do something and somehow stop Ravana from getting invincible. Ganesha through his yogic powers filled Ravanas stomach with water. Soon Ravana could hold it no longer and he had to relieve himself. Ganesha took the form of a child and approached Ravana. Ravana asked the child if he could hold it for some time, till he relieved himself, but should not put it down. Ganesha in his disguise agreed to do so, but also mentioned that if the lingam got heavy then he would place it on the ground, but then he would call him before doing so. Ganesha held on to the lingam and no sooner had Ravana left, he cried out saying he could not hold it as it was getting heavier by the moment. He called out for Ravana three times, but Ravana could not return on time. Ganesha then left the lingam on the ground and ran away. Ravana came to the spot, and tried to move the lingam, but could not. He put all the pressure of his twenty hands, but could not move the lingam. However, due to the enormous pressure, applied by him the shape of the region changed to resemble the ear of a cow and hence the place is now known as Gokarna (ear of the cow) which lies in the Uttara Kannada district of Karnataka. Since then the lingam at Gokarna is known as the Mahabaleshwar lingam (maha – great, bal – power, strength and eshwar – god) as the lingam could not be moved even by the strength of the mighty Ravana. When Ravana realized that he was cheated by a child, he chased the child to hit him on his head. 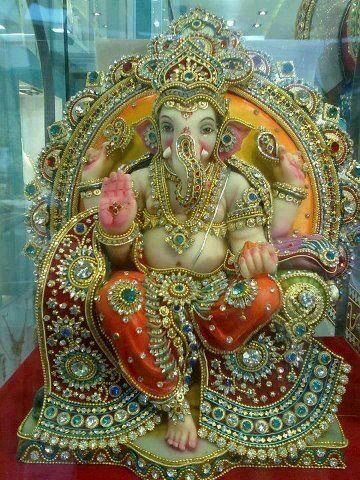 Later Ganesha took his original form. It is said that the Ganesha idol in the premises of the temple has a hollow in the head which was formed after Ravana hit him there. The idol is thus also referred to as Kuttu (to hit with folded fists) Ganesha. The devotees worship the idol by gently tapping on the head of the idol with folded fists! Some versions say that Ravana took the help of the child, as it was evening and time for him to perform the sandhya vandana (evening prayers). This myth signifies the contribution of Lord Ganesha from stopping Ravana from becoming invincible. The myth also lends credence to the divine association with the region and the temple which has religious attractions like the temple. 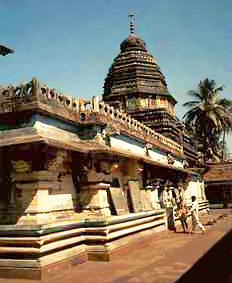 Gokarna is considered to be a centre of Sanskrit learning and many Hindus from the nearby regions perform the last rites of the dead at Gokarna. The ten day festival of Ganesh Chaturthi comes to an end today, and so does my series on Ganapati. Ganpati Bappa Moriya Pudhchya Varshi Lavkar yaa (meaning - Oh Ganpati My Lord, return soon next year)!! The 10-day Ganapati festival started last week and I have not put up a single article on my friend Ganesha, and yesterday I got a knock on my head by his divine trunk! So here’s a short one, for all who missed the deity on my Blog! Ganapati is a deity revered all over the country. However, as I have mentioned earlier, he is a celibate in South India which is different from the rest of India. (Refer to http://utkarshspeak.blogspot.in/2010/09/ganesh-marriage.html dated 12/9/2010). The reason of his celibacy is a subject which needs an elaborate discussion. But today, let’s see how Ganapati was responsible for bringing the river Kaveri (also spelled as Cauvery) to South India. According to a legend, to celebrate the marriage of Lord Shiva and Parvati, all the gods, sages, people, birds and animals travelled up to North. This caused a bit of an imbalance on earth, with all the pressure tilting towards the North. Seeing this, Shiva asked Rishi Agastya to go down to the South and ensure that the balance was restored. Agastya was saddened by this task as this would mean that he would not be able to witness the wedding. Lord Shiva understood his plight and told him that he would ensure that he got to view the wedding sitting in South. He then gave some water of river Ganga from his matted locks, so that he could release the waters in South as the region was suffering from a lack of water in those days. Soon Agastya reached the southern parts of the country, with the waters in his kamadala, a pot, and got busy with his penance and didn’t release the waters. Time passed and unknown to the Rishi, the dryness reached a critical state. Lord Ganesha on the advice of Narada Muni, took the form of a crow, went and sat on the kamandala, thus toppling it and allowing the waters to flow. The river is known as Kaveri, as it was enabled by a crow. Another version of the story says that the river Kaveri was earlier known as Ponni and had been disrespectful to Rishi Agastya. In his anger, he had punished her by trapping her in his kamandala. 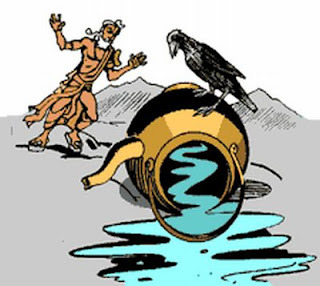 On the suggestion of Narada Muni, Lord Ganesha took the form of a crow and released the trapped waters and thereafter the river Ponni was known as Kaveri. 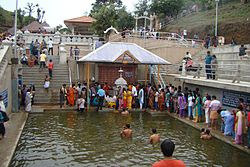 The place where the water was spilt by Ganesha has come to be known as the Thalakaveri and on the site is a thriving temple by the same name, near Bhagamandala in Kodagu district, Karnataka, India. Quite a simple myth anybody would say. Such myths have a very limited function. They establish divinity to some rivers, which do not have anything as grand as the myth associated with River Ganga. Rivers have been revered in our country and such divine associations go a long way in granting them the same significance as given to some of the Northern Rivers like Ganga and Yamuna, who were both mythological characters. In days when traveling was not very common, such myths lent credibility to the idea that bathing in such rivers was as good as bathing in Ganga. Another important fact is that the Southern parts of India are known for the cult of Skanda, i.e. Kartikeya, the other son of Lord Shiva. Such minor myths gave some foothold to an otherwise well known deity like Ganapati. Next we will see another similar contribution of Ganapati to South India. Swami Vivekananda, an icon of Hidutva? Did this offend you? If ‘Yes’, then I am glad as such statements should be considered offensive to the status and stature of Swami Vivekananda. Lately a certain Chief Minister of our country has taken it on himself to spread the word of the apostle and has ended up interpreting the whole philosophy in his own myopic way. It suits his political agenda, but as proud Indians, we should refrain from falling prey to such sudden ‘adoptions’ of our icons for narrow parochial reasons. When Swami Vivekananda said “Garv se kaho hum Hindu hai (Say with pride, that I am a Hindu)”, he used the word Hindu to evoke a sense of patriotism and nationalism. For Swamiji, Hinduism was a way of life, a philosophy, the essence of which he had gathered after intense study of the ancient scriptures and intellectual debate. Unfortunately, people who know nothing of the ancient philosophy called Hinduism are misinterpreting the quote to suit their political agenda, probably for want of a cause. If only this statement was used to instill a sense of pride for the nation, it would have gone a long way, especially when the spirit of nationalism is at its lowest! Using the quote to give vent to ones divisive political agenda is the largest disservice that can be done to the name and stature of Swamiji. 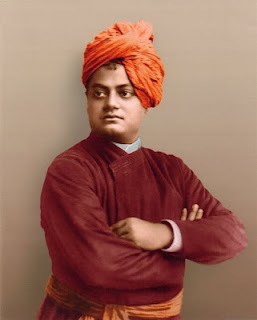 Anybody who has read Swami Vivekananda’s Chicago address, which was delivered way back in 1893, has no choice but to appreciate Swamiji’s vision of religion and above all co-existence of every religion. No wonder, that the gathering was spellbound and shocked to hear a monk speak about the broad-based ‘concept’ of Hinduism, which today is being tarnished by dirty, blood-stained hands, who know little and pretend more. A champion of secularism, whose ideas of religion is beyond the comprehension of certain class of people, should be left alone. Unfortunately, in our country, we raise our voices on slightest and silliest of issues, but choose to keep quiet when such national icons are misused and misrepresented. Swami Vievekananda is a national hero and definitely not the hegemony of a certain political class. As Indians, we should shun such public posturing by certain people and the least that we can do is raise our objections. In the last story, we read about Kacha and Devyani and how love blossoms between the two, but Kacha could not marry Devyani and both end up cursing each other. After Kacha leaves the ashram of Shukracharya, Devyani soon forgets all about Kacha and resumes life as if nothing had happened. Devyani and Sharmishta, Asura King Vrishaparva’s daughter, were good friends. Once while playing in the lake, both get wet and while changing dresses, the dresses get exchanged. On seeing Devyani in a princess’s attire, Sharmishta was overcome by anger and rebuked Devyani for wearing her dress, especially when she was not a princess, but the daughter of someone who was in service of her father, and thus a servant. In her anger, she pushed Devyani who fell in a small well, which was not very deep and did not have much water. Sharmishta without giving it any thought left the place in anger. Soon it was dark, Devyani was alone, burning in rage, was beginning to be get scared. 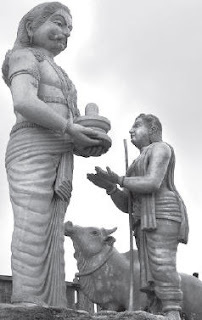 The well-known King Yayati of the Chandra vansha (lunar dynasty, one of the most important lineage of the times) was passing by and thirst drove him to the well and soon rescued Devyani. Devyani was moved by his princely looks and the warmth in his touch, while pulling her out of the well and this kindled her love once again. She proposed to marry him. King Yayati on learning that she was Shukracharya’s daughter, suggested that they could get married only after parental consent and left her back at her ashram. On reaching the ashram, Devyani told the whole story about Sharmishta and insisted that her father leave the ashram as the asura’s did not deserve him. Shukracharya was well aware of her daughter’s anger and knew Sharmishta well and did not want to lend too much credence to the quarrel between the two, but Devyani would not hear anything. Soon the matter reached the ears of the King, who came down to the ashram to apologise. 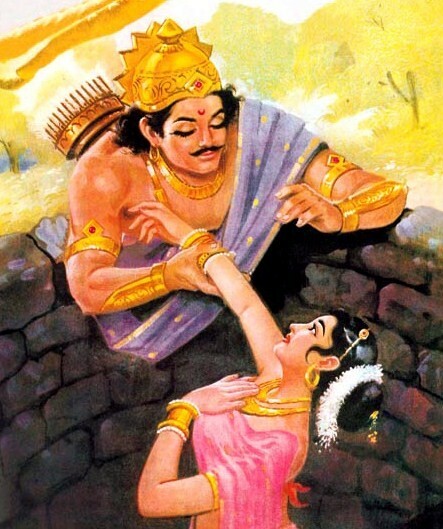 Shukracharya said that he was not hurt, but it was his daughter and if she was pacified then all would be well. The King then approached Devyani, who was now all the more arrogant when she saw the King trying to pacify her. After a lot of pleading by the King, she agreed to relent, on the condition that Sharmishta should be her servant for life. King Vrishaparva went back with a heavy heart as he could not bear to see his only daughter relegated to a life of servitude. When Sharmishta, who was beginning to realise her folly came to know about it, she immediately agreed to Devyani’s conditions, as Shukracharya was very important for the well-being of the asuras and after all she was at fault. The King agreed and Sharmishta was sent as a servant to Devyani. Soon King Yayati and Devyani got married. Shukracharya had agreed to the alliance as he knew that no rishi would get married to the hot-headed Devyani and had made Yayati swear that he would not take another wife and would be loyal to Devyani all his life. After marriage, Sharmishta accompanied Devyani to King Yayati’s palace and soon, love blossomed between Yayati and Sharmishta. Sharmishta was of royal lineage and knew how to take care of men, whereas Devyani was a bundle of arrogance. The two started meeting in secret, since Yayati could not get married to Sharmishta, lest he incur the wrath of Shukracharya. All was going well, till Sharmishta delivered Yayati’s son. When Shukracharya came to know about it through Devyani, he cursed Yayati that he would turn an old man immediately. This way, he would burn with desire but would not be able to satisfy the fire burning within him. King Yayati rushed to Shukracharya and pleaded that he be not punished in such a manner. Later Devyani too joined Yayati as she did not want to live with a dying old man. Shukracharya suggested a way out. He said, that if any of his sons, agreed to exchange their youth for Yayati’s old age, then he could be young again. Yayati called his sons, from Devyani and Sharmishta and told them about the curse and said that whoever agreed to exchange his youth with him would be declared the King. Devyani’s son, Yadu declined, but Sharmishta’s son, Puru agreed. Soon Yayati gained his youth, but left Puru an old and dying man. Yayati went back to life of wine and women for many years till he realised the vanity of it all. He came back to his son, and gave him his youth back. He then declared Puru as the King. When Yadu objected to it, since he was the son of the rightful queen and also the eldest, Yayati said that Puru had suffered on his behalf and he was promised the throne before exchanging the age. Yayati further cursed Yadu, that he and his descendants would never be Kings ever. This enraged Yadu and he left the Kingdom. Puru was later declared the King and Yadu left the land of his birth and settled down in Mathura. The story of Yayati is also very important from the perspective of man's inherent desire for everlasting youth, and lengths he would go to attain it. The descendants of Yadu became the well-known Yadavs in the epic Mahabharata, one of them being Krishna, who too never became a King. The descendants of Puru were Dushyant (of Shakuntala fame), Bharata and further down, Kaurava’s and Pandavas.